Junipers (Juniperus spp.) are versatile, adaptable evergreens, hardy from U.S. Department of Agriculture plant hardiness zones 2 through 9. They remain popular, low-maintenance choices for home landscapes. 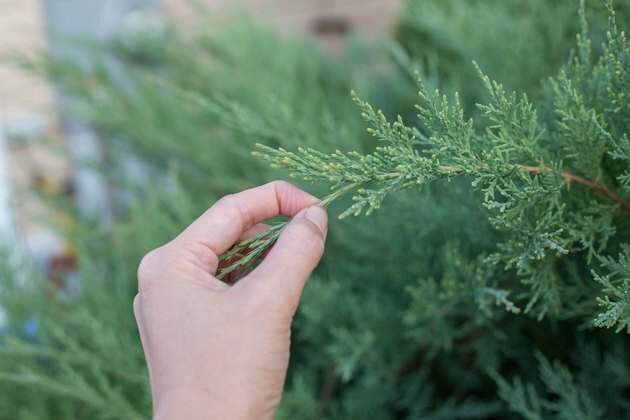 Drought- and pest-resistant, junipers keep their green to silvery gray foliage year-round and tolerate pruning well. However, the plant's attractive, natural form rarely requires heavy pruning. Prune junipers if the plant is overgrown or branches are damaged or dead. Pinch back or snip errant green shoots on junipers before they harden and become woody. This promotes branching and reduces the need for future pruning. 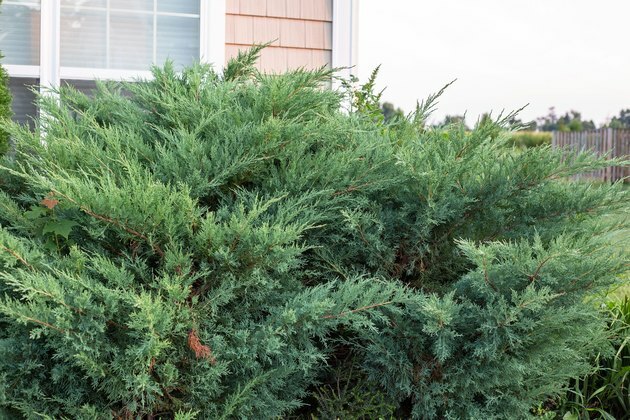 Pinch back shoots anytime except late summer, when the bush needs new growth. 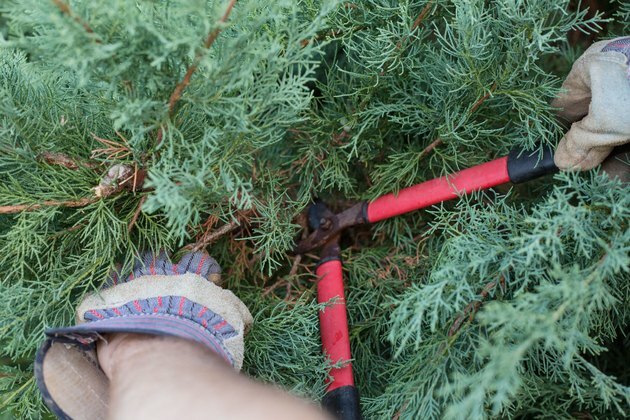 Wear gloves and long sleeves when pruning, and use pruning shears for small shoots. Always sterilize pruning blades with household disinfectant before and after each bush to prevent the spread of disease. 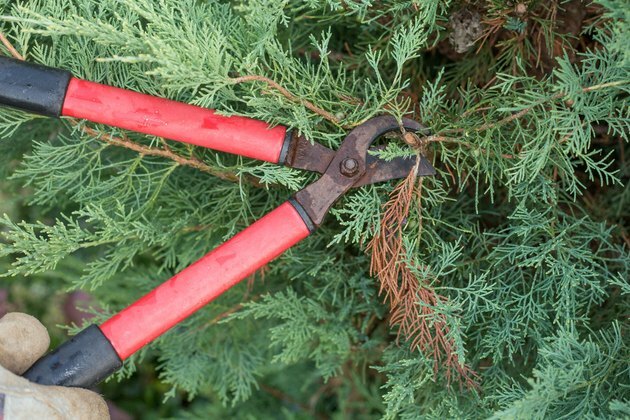 Use a sharp bypass lopper to prune away dead and damaged limbs throughout the year. This makes a clean, crisp cut that heals easily. 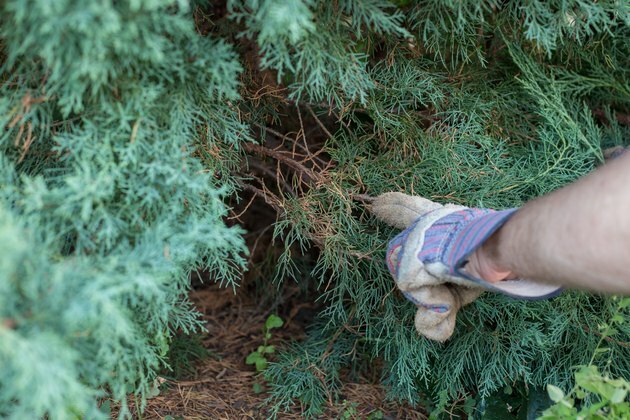 Cut branches at a 45-degree angle to the trunk of the juniper. Use a sharp pruning saw to cut larger limbs. Prune branches just above the ring of bumpy tissue known as a branch collar, where branches meet larger stems. Don't cut into the collar, but angle the cut right above it. This area has an abundance of cells, and the bush will have an easier time healing and recovering from the pruning. Prune large overgrown juniper in stages over several years, starting in late summer. 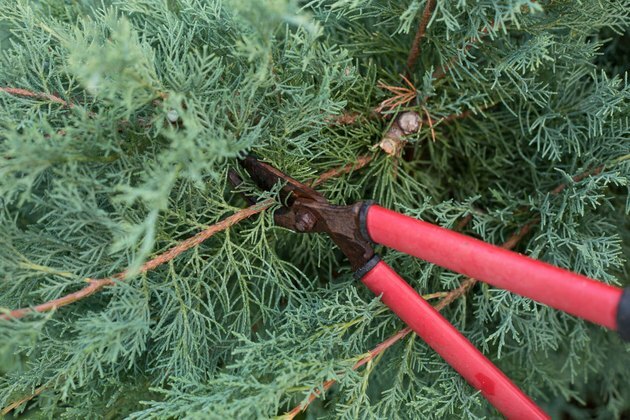 Progressively remove overly long or misshapen branches. Work throughout the bush, so that it stays balanced and never lop-sided. Never remove more than 25 percent of the bush at one time. Follow up with general shaping in spring. Avoid cutting beyond the lowest green leaves on a branch, unless you are pruning out the entire branch back to its base. If you cut too low -- beyond the green and into the woody, leafless branch -- the branch won't recover and grow back.